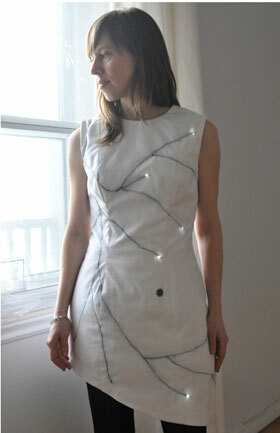 Canadian designer-artist Valérie Lamontagne founded 3lectromode with the vision of innovating in the field of wearables by combining technology with customizable prêt-â-porter fashion. Valérie and her small design group is focusing on the development of accessible wearables combining state-of-the-art technology and current fashion research, creating designs that resonate with our everyday needs as well as being sensitive to our environment. Instead of creating design concepts that surprise and are lovely to look at, 3lectromode is commercializing the creations via their new online shop. 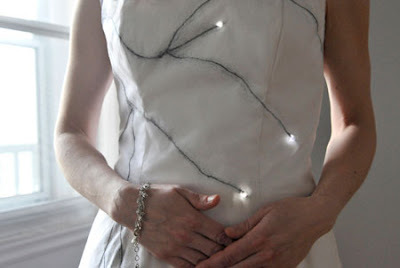 What’s more, you can either order the Asymmetrical Dress (in the photos) or the Symmetrical Dress as ready-to-wear for $500.- or as kit for $250.- The kit contains everything needed for the eTextile seamstress to make an LED-embedded dress: Dress pattern and graphics printed on 100% cotton, lining pattern and circuit guides on Polyester blend, Conductive zipper, programmed LilyPad, 15 LEDs, conductive thread and batter inclusive charger. I love this retail concept where one can chose to buy the complete functional and gorgeous looking dress or to use a kit for personalization adjustments. The LED pattern will light up based on the selection you make when ordering the dress or kit: light sensor, temperature sensor or Accelerometer sensor. A fabulous concept, design wise as well as business wise – it’s as unique as interactive clothing is in itself – ready for a Brave New World of fashion.